^ a b BirdLife International (2013). "Aquila chrysaetos". IUCN Red List of Threatened Species. Version 2013.2. International Union for Conservation of Nature. Retrieved 26 November 2013. ^ "Golden Eagle, Life History". All About Birds. Cornell Lab of Ornithology. 2009. Retrieved 26 December 2010. 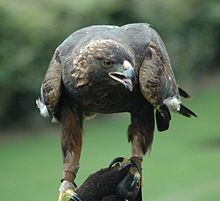 ^ "Golden Eagle May Set Record". Newwest. Retrieved 26 June 2015. 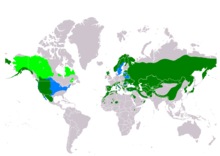 ^ "Birds of North America Online—Birds of North America Online". Bna.birds.cornell.edu. Retrieved 8 November 2012. ^ Nye, Peter. "Journey North Bald Eagles". Journey North. Retrieved 22 April 2013. ^ a b c d Jollie, Malcolm (1947). 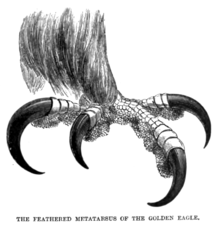 "Plumage Changes in the Golden Eagle" (PDF). Auk. American Ornithologists' Union. 64 (4): 549–576. doi:10.2307/4080715. JSTOR 4080715. Retrieved 27 December 2010. ^ Clark, William S (1983). "The field identification of North American eagles" (PDF). North American Birds. 37 (5): 822–826. Retrieved 27 December 2010. ^ a b "Golden Eagle Fact Sheet". San Diego Zoo. Retrieved 1 May 2013. ^ a b c d Helbig, A.J. ; Kocum, A.; Seibold, I.; Braun, M.J. "A multi-gene phylogeny of aquiline eagles (Aves: Accipitriformes) reveals extensive paraphyly at the genus level" (PDF). Molecular Phylogenetics and Evolution. 35: 147–164. doi:10.1016/j.ympev.2004.10.003. PMID 15737588. Archived from the original (PDF) on 13 August 2012. ^ "Lophaetus pomarinus". The Peregrine Fund. Retrieved 22 April 2013. ^ "Aquila morphnoides". The Peregrine Fund. Retrieved 22 April 2013. ^ "Aquila wahlbergi". The Peregrine Fund. Retrieved 23 April 2013. ^ "Aquila africana". The Peregrine Fund. Retrieved 23 April 2013. ^ Wink, M.; Sauer-Gürth, H. (2004). "Phylogenetic relationships in diurnal raptors based on nucleotide sequences of mitochondrial and nuclear marker genes". In Chancellor, R.D. ; Meyburg, B.-U. (eds.). Raptors Worldwide: Proceedings of the VI World Conference on Birds of Prey and Owls, Budapest, Hungary, 18–23 May 2003. World Working Group on Birds of Prey/MME-BirdLife Hungary. pp. 483–495. ISBN 9638641819. ^ "Birds of Kazakhstan. Golden Eagle (Aquila chrysaetos chrysaetos)". birds.kz. Retrieved 23 April 2013. ^ "Birds of Kazakhstan. 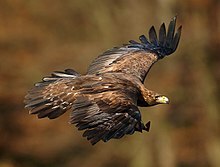 Golden Eagle (Aquila chrysaetos homeyeri)". birds.kz. Retrieved 23 April 2013. ^ "Birds of Kazakhstan. Himalayan Golden Eagle (Aquila chrysaetos daphanea)". birds.kz. Retrieved 23 April 2013. ^ "Himalayan Golden Eagle". Foundation for Ecological Security- Indian Biodiversity. Archived from the original on 4 July 2013. Retrieved 23 April 2013. ^ "Birds of Kazakhstan. Golden Eagle (Aquila chrysaetos kamtschatica)". birds.kz. Retrieved 23 April 2013. ^ Wingfield, G.A. (1991). "Central plains buteos and Golden Eagle". In Pendleton, B.G. (ed.). Proceedings of the Midwest raptor management symposium and workshop. National Wildlife Federation. pp. 60–68. ISBN 0945051506. ^ Collopy, M.W. "Foraging Behavior and Success of Golden Eagles" (PDF). Auk. Retrieved 24 April 2013. ^ Thévenot, M.; Bergier, P. & Beaubrun, P. (1985). "Present distribution and status of raptors in Morocco". In Newton, I. & Chancellor, R.D. (eds.). Conservation studies on raptors. ICBP Technical Publication. 5. International Council for Bird Preservation. pp. 83–101. ISBN 094688806X. ^ Daly, Matthew (18 April 2013). "New federal rule would permit thousands of eagle deaths". Bigstory.ap.org. Retrieved 14 March 2017. ^ "New Wind Energy Permits Would Raise Kill Limit of Bald Eagles But Still Boost Conservation, Officials Say - ABC News". Abcnews.go.com. 4 May 2016. Retrieved 14 March 2017. ^ "Haliaeetus vocifer". The Peregrine Fund. Retrieved 24 May 2013. This page was last edited on 10 March 2019, at 17:45 (UTC).